The founder and first minister of the congregation was Thomas Gillespie, one of the founders of the ‘Relief Denomination’. This concern for the homeless is reflected in the church today, being very much a town centre church with a passion for the community it serves. The present church was built as a United Presbyterian Church in 1848-9 by Andrew Balfour of Dunfermline. The design has been attributed to Balfour, but he might have been the builder. 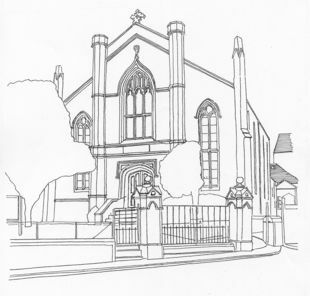 There are striking parallels between Gillespie Memorial Church and other church work by the Glasgow architect James Brown; an illustration celebrating the opening of the building, drawn by Brown’s office, is displayed within the church. The building is in a Tudor Gothic style with a broad gable front with octagonal buttresses rising into pinnacles. The church has undergone a number of significant alterations, including the introduction of the galleries, and the creation and extension of the attached church halls. The stained glass is by R Douglas McLundie. SUnday: 11.00 am and 7.00 pm.